Consider Your Level: If your apartment’s on the 20th floor of your building, potty trips and walks can be a bit of a hassle. Other high-rise residents recommend patches of grass or training pads to make up for the convenience of living in a lower level. Visit Your Local Dog Park: You probably have a handful of neighborhood dog parks that are within walking distance—so make sure to frequent them as much as you can! Socializing with other pets is a must in order to raise a properly trained dog. Just don’t forget that each park has their own system in place, so check their rules and regulations before visiting. 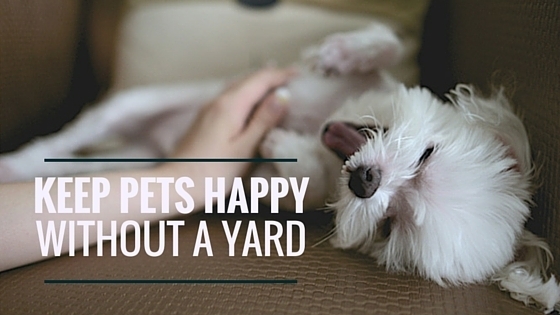 Bring The Yard To Your Home: If you have a pet who loves plants, give them their own (safe) greenery to play with. While cats can be very fond of eating plants, take note of those that can be toxic and do your best to be familiar with common house plants that you should avoid. Hire A Dog Walker Or Sitter: Working away from your home can make providing the right care that your pet deserves extra challenging. With a dog walker or pet sitter, much like your trusty Pet Peeps, you don’t have to worry about your dog feeling lonely or lacking care and attention. If you don’t want to leave your pet unattended and want to make sure they’re active all throughout the day, then hiring someone to focus entirely on them is ideal.